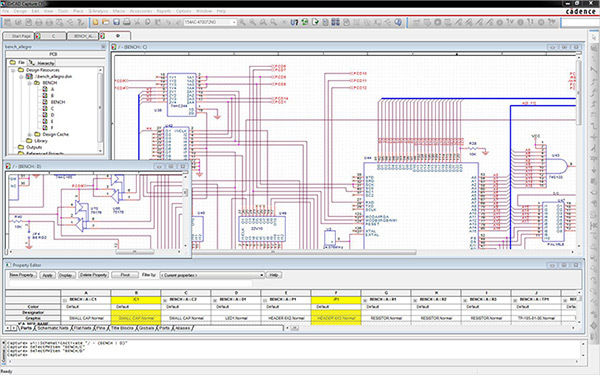 Easy-to-use and powerful, Cadence® Allegro® Design Entry Capture and Capture component information system (CIS) is the most widely used schematic design solution, supporting both flat and hierarchical designs from the simplest to the most complex. Seamless bi-directional integration with Allegro PCB enables data synchronization and cross-probing/placing between the schematic and the board design. Allegro Design Entry Capture and Capture CIS allows designers to back-annotate layout changes, make gate/pin swaps, and change component names or values from board design to schematic using the feedback process. It also comes with a large library of schematic symbols and can export netlists in a wide variety of formats. Allegro Design Entry Capture and Capture CIS integrates the schematic design application with the added capabilities of a CIS. The CIS allows designers to search, identify, and populate the design with preferred parts. With easy access to company component databases and part information, designers can reduce the amount of time spent researching needed parts. The industry’s first PCB design and verification flow to achieve “Fit for Purpose - Tool Confidence Level 1 (TCL1)” certification enables you to meet stringent ISO 26262 automotive safety requirements. The flow includes everything from design authoring to simulation to physical realization and verification using the PSpice®, Allegro, and OrCAD® product suites. The high-performance design entry, simulation, and layout editing tools provide an integrated environment for design engineers to validate the safety specifications against individual circuit specifications for design confidence. For information on the safety manuals, Tool Confidence Analysis (TCA) documents, and compliance reports from TÜV SÜD, download the Functional Safety Documentation Kits through Cadence Online Support.